SRDx is the new Photoshop plug-in for effectively removing image defects. Defects, such as dust and scratches, are almost unavoidable on your analog image. With the scanning process they also end up on the digital image. And even if you have the possibility to use an infrared-based dust and scratch removal when scanning, there are several types of images for which this technique is not applicable, such as black-and-white or Kodachrome images. 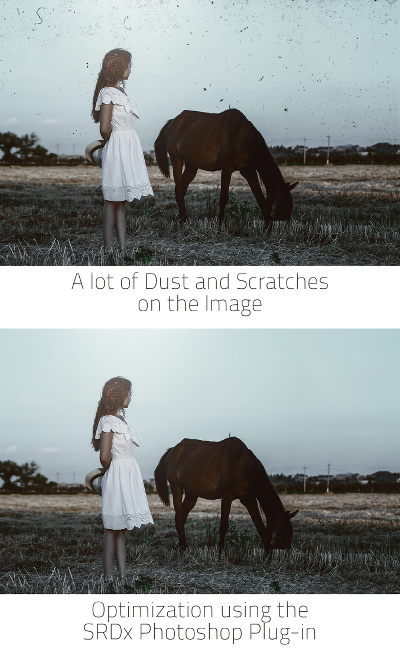 The solution for this problem is the new SRDx, which thanks to innovative technology and a new handling concept considerably simplifies and speeds up the formerly tedious correction of image defects in Photoshop. A combination of intelligent automation, ingenious defect marker and content protection tool for fine tuning saves you a lot of time and labor. Intro-Movie – Look and see! And also try the free SRDx Plug-in demo version.